Polyurethane control arm bushings maintain better alignment while cornering, stopping, and hard launching than soft OE style rubber bushings. 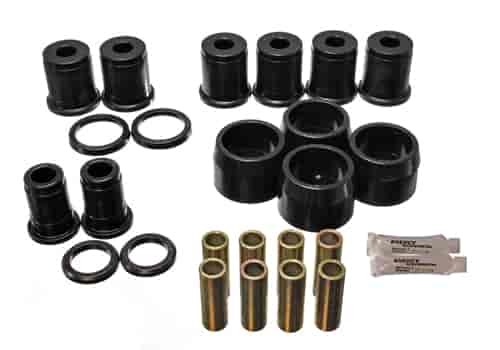 Energy suspension control arm bushings improve handling on all vehicles, and are a must for lowered vehicles where weight transfer causes distortion. All Energy Suspension polyurethane control arm bushings are full floating and non-binding, and they will out last OE style rubber bushings. Better caster and camber is maintained during hard driving. Does Energy Suspension 3-3149G fit your vehicle? 3-3149G is rated 5.0 out of 5 by 1. Rated 5 out of 5 by Dobromi from rear control arm bushings for 1965 impala Installed a new rear end housing so decided to replace these because the old ones were pretty well wore out. Went in fairly easy but you will need a torch and some way of pressing them in and out. Using the existing shells made the job a lot easier. I used an oxy-acetylene torch to get the old ones out and a big vice and a few sockets to press the new ones in.